Having a baby is an intense experience and one that is both full of joy and anxiousness as a new parent. Parents are often left wondering if they are doing it right! We talk about routine, sleep, crying, feeding but what about play? How do I play with my baby? Is a question I often hear from parents. What type of toys do I need and what is best? Is another. Whenever anyone walks into a toystore or a baby shop it very quickly becomes overwhelming with the array of choice. What to choose, what is the best type of toy, what do I really need? So lets talk about ‘play’ in the birth to 3 months age. At this age, there is very little you need in the way of play objects or toys. Play from birth to 3 months really is as easy as talking to you, the parent. It involves language and it is the interaction between parents (and other adults) and your baby that is the key. So talk to your baby as often as you can. Talk to them when you change their nappy, when they are in your arms, sing, chat and talk about what you are doing. Talk when you play in a simple way like ‘Up you come’. Speak slowly. Use lots of repetition. Touch your baby when they are up and happy and wanting to talk and be with you. Touch their arms and hands, touch and tickle their feet. Touch their face and allow their little fingers to curl around yours. All these types of touching, talking and play build the basis for your baby’s relationship with you and is like a foundation for their future play. It’s the building blocks. They also learn in this time to explore their sounds and poke out their tongue – they are talking to you! They have learnt that we take it in turns to talk in a conversation and start to practice or participate. So when your baby at about two months of age is chatting back to you, play the ‘turn taking’ game but you will need to respond to when your baby is ready to chat rather than when you are ready. This chatting and sound making will be in your baby’s happy awake time. Once they become tired and scratchy it’s time to finish the chatting, wind down and get ready for sleep. 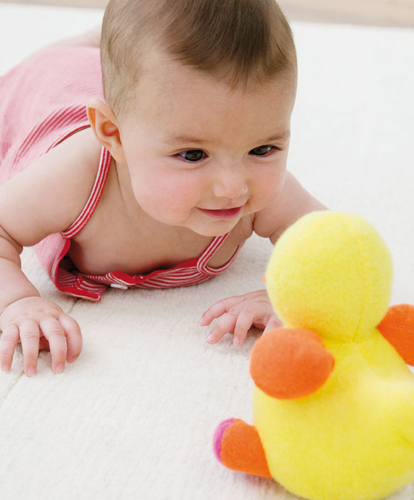 Looking and gazing intently at you is also part of your babies communication and play. So ‘play’ back with them when they are in the mood to look at you, look back, stop what you are doing and be in the moment. This is very valuable in terms of communicating with you. By three months, play begins to change, your baby will need things to look at and listen to. By the end of these months, your baby will be able to hold a very light weight rattle and shake – wave it around and will thoroughly enjoy doing so. Your baby will start to reach towards some object / toys / items or if you hand a toy to them they will enjoy exploring it by putting it in their mouth! That’s how they explore objects at this age. It’s very sensory. So give them safe object / items to explore with their mouth. A soft spongy ball, very small and light is a good choice, some very simple bells or lightweight rattles that are good to listen to. Bright colours, easy to hold, lightweight and safe to chew will be loved by your baby. Look for different textures if you can like cloth so there is different feels for your baby, again sensory. A mobile above their cot with contrasting colours like black and white, your baby will find these fascinating to look at towards the 3 month age. At 3 months make sure that your baby also has time alone to play with toys and time to look around by themselves. You do not need to be involved all the time. Your baby will love music and singing and kick their legs. As tempting as it is and as alluring as it is to a baby, resist the temptation to use the tv, ipad or electronics to entertain your baby at this very young age. There is no room in their life for this as their instincts at this age are all about communication and talking to you, listening to you and watching the world around them and learning this way. Television impedes your baby’s development at this early age. Your baby needs a person or adult that talks back, interacts to their expressions and sounds and a tv – ipad cannot do this. Do not have the tv on in the background as it distracts your baby’s listening ability to focus on what you are saying and affects their concentration too.